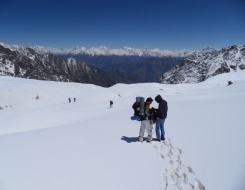 The Bara Bhangal trek is one of the most challenging treks in the whole Manali region. 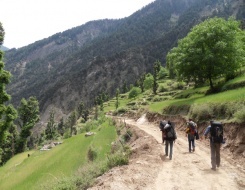 The trek demands crossing of two passes at an altitude of 5000 m and hence the expeditors having a good sum of trekking endurance and prior experience in trekking and climbing to explore the remote village of Bara Bhangal and some of their undefined ranges. The trek that normally begins from the Hidimba Temple in the Manali town takes the ascenders across the thick alpine forests to reach at the campsites of Lamadug. 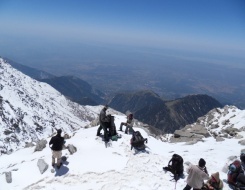 The trekkers can then explore the Dhauladhar and Pir Panjal ranges that peep through the horizon at such heights. The path then continues through the Rhododendron and Pine forests to reach at the next step of camping at Riyali Thach. The next day will take the trekkers to the best campsite at the base of the Kalihani Pass to find the magnificent views of Deo Tibba, Indrasan and Indrakila. While crossing the Kalihani Pass at an altitude of 4800 m will remediate the moods through visualizing ice, snow on the glacier and moraines at the valley. While heading downwards the expeditors can find the ample choices of glacial lakes on their routes along with the lines of trees side by side. 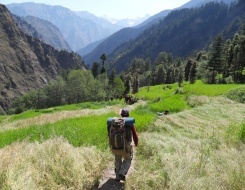 By crossing several streams the trekkers can reach to Bara Bhangal, one of the remote villages in India and that continues to the Thamsar Pass at the height of 4600 m with a stopover at Murh. The village of Bara Bhangal is one of the few areas in the country that has been relatively untouched by the vagaries of globalization. Take the trek descending through Plachak, Rajgundha and then towards Billing which is a famous spot for paragliding to explore the adventure sports activities to make the trekking fun more genuine and rewarding. Arrival at Manali by morning. On arrival transfer to hotel for relax. After leisure visit Hadimba Devi temple, old Manali, Tibetan Monastery and the Mall road. Dinner and overnight stay at hotel. In the morning we will trek to Lama Dugh. The climb is through thick forests but there is no water point after departing from Manali. As one gains height in this steep climb, the distinct views of different faces of Indrasan, Deo Tibba and peaks of Bara Shigri glacier open up. In the last lag, the path turns to the right and one traverses the ridge horizontally and enters the campsite on an alpine plateau studded with thick growth of alpine flowers. Dinner and overnight stay in camp. Today we will trek to Rani Sui. The height gain on this day is approximately 1 km. The trek is through steep a ridge below Thanpri Tibba (4000m). From this point, one can have a magnificent glimpse of Manali, situated on the left bank of River Beas and the whole upper Kullu valley, which appears swathed in the different colors of the season. Dinner and overnight stay in tents. The day is challenging and full of adventure. The Manali Pass offers some great views of the higher peaks in the region - Indrasan, Deo Tibba and Hannuman Tibba. Since the day involves a steep ascent to the pass and a descent to the glacier, it is advisable to start early. Dinner and overnight stay in tents. The fourth day's walk takes one past the Taintagiri Nullah to the river Ravi. After the Manali pass, this is a considerably easy day with the only challenge being in crossing the Taintagiri Nullah. Dinner and overnight stay in tents. The second glacier of the trek is crossed on this day. Starting early, the trail follows the river and then past the Karu glacier. Dinner and overnight stay in tents. The trail now continues down the Ravi River into the deodar forest, to the only large village in the valley, Bara Bhangal. Explore village and surrounding areas. Bara Bhangal is isolated and seldom visited. Members of the Gaddi tribe inhabit it. Dinner and overnight stay in tents. Branch northward to begin the approach to Taintu Pass. The vegetation for the next two days is similar to that found in Lahaul. In the morning after breakfast trek back to Kaori Got Spring. Dinner and overnight stay in tents. In the morning set out to climb up to the base of the pass. Dinner and overnight stay in tents. This is a strenuous day over ice gully and moraine. From the pass, one can see into both the valleys of Kullu and Bara Bhangal. Beas Kund is a lovely alpine meadow, which has a small pond which is considered the traditional source of the River Beas. Dinner and overnight stay in tents. In the morning walk down the Beas river over moraine and grassland to the popular Solang Nullah and from here drive to Manali. Dinner & overnight stay in hotel. Day at leisure and in the evening drive to Delhi by AC Volvo coach. Overnight journey.